The No. 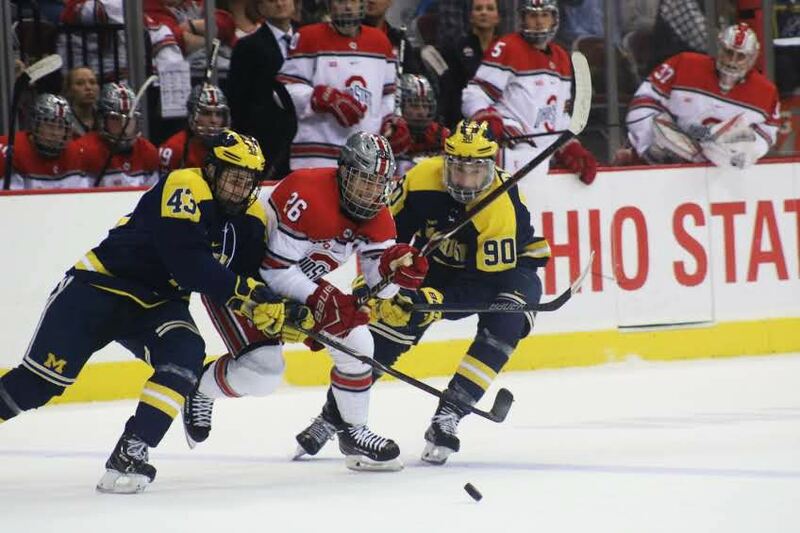 6 Ohio State men’s hockey will battle arch-rival No. 11 Michigan for the fifth time this season when it meets the Wolverines in the semifinals of the Big Ten tournament at 7:30 p.m. Saturday at Nationwide Arena. 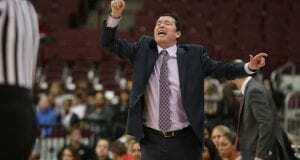 The Buckeyes swept the regular-season series against the Wolverines for the first time since the 1985-86 season. But senior forward Matthew Weis doesn’t see the sweep mattering now with one game separating the teams from the conference final. After getting past Michigan State in the quarterfinals, the Buckeyes will go from playing in a three-game series to single-elimination games, which means teams can’t afford a slip-up in focus. 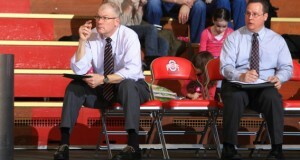 Ohio State head coach Steve Rohlik does not foresee that being a problem. The Wolverines are one of the hottest teams in the country, winning seven straight games and taking care of Wisconsin in a quarterfinal series sweep in Ann Arbor, Michigan. Powering Michigan’s recent success are senior forward Tony Calderone and junior forward Cooper Marody. Calderone leads the conference with 23 goals and Marody tops the Big Ten with 32 assists. A good aspect for any championship-caliber team chasing a title is its depth, and the Buckeyes have six players with double-digit goals. Their top scorers junior forward Mason Jobst (19 goals), sophomore forward Tanner Laczynski (15 goals) and Weis (11 goals) have been difference makers in recent weeks. Even when those players have faltered in scoring, others have picked up the slack with senior forward Christian Lampasso (10 goals) and junior forwards Dakota Joshua (13 goals) and Freddy Gerard (11 goals) giving the team balance. This weekend will have a different feel to it than last week because the Buckeyes aren’t playing in the cozy confines of the Schottenstein Center. Instead, they will take on the Wolverines at Nationwide Arena, the home of the NHL’s Columbus Blue Jackets. The puck will drop at 7:30 p.m. Saturday and the winner will take on the victor of the other semifinal game between Notre Dame and Penn State.